The world's presumably happiest metal outfit is back with another record and it's, in a positive way, just as goofy as it always is and Chris Bay and his crew undeniably still know how to cheer people up with some lightsome music. Already with the last album, Beyond, the band glanced a little bit at the early work and I think it's the same approach again, yet to an even greater extent than last time, really. Of course there are big differences too, as it's been quite a long time since the first records were out and if you would compare every album note for note, but for the most part it's pretty recognizable though, seen over their entire time of activity, with rather many speedy songs, some mid-tempo tracks and a ballad to diversify the record a little bit further. The 5 initial songs are pretty much Freedom Call at its best, but from where the ballad Cradle Of Angels starts and to the end of the record, besides the song Riders In The Sky, the songs overall are unable to come close to the opening 24 minutes. Maybe I'm being a little bit over-demanding when I compare the two halves, because the second one probably would be considered pretty good if it wasn't for the first half's greatness. Some of the tracks, and in particular Ghost Ballet and Rock The Nation, maybe should have been only put on a Japanese release as bonus tracks in any case. 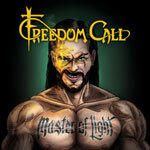 Freedom Call nevertheless doesn't disappoint the fans with Master Of Light. If you on the other hand never enjoyed what the band did before, you will surely don't like what's presented on this album either. It's brisk, hearty, encouraging and it's spreading unconstrained joy just the way the band's music is supposed to do.